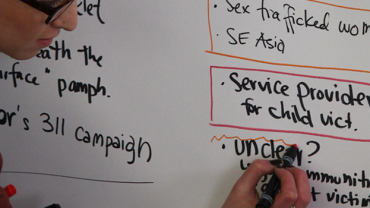 How can designing effective communications help reach the most hard-to-reach populations? This was the question facing Safe Horizon, one of the largest service providers for survivors of human trafficking in the United States, at desigNYC in 2012. Each year, an estimated 700,000 to 2 million people are trafficked globally. Services exist to help them, but reaching victims of human trafficking is exceedingly difficult. Victims are often isolated with little access to information. They may not know their rights, how to seek support, or that they are even being “trafficked”. Since 2001, Safe Horizon’s Anti-Trafficking Program has assisted more than 500 survivors of human trafficking in New York City. 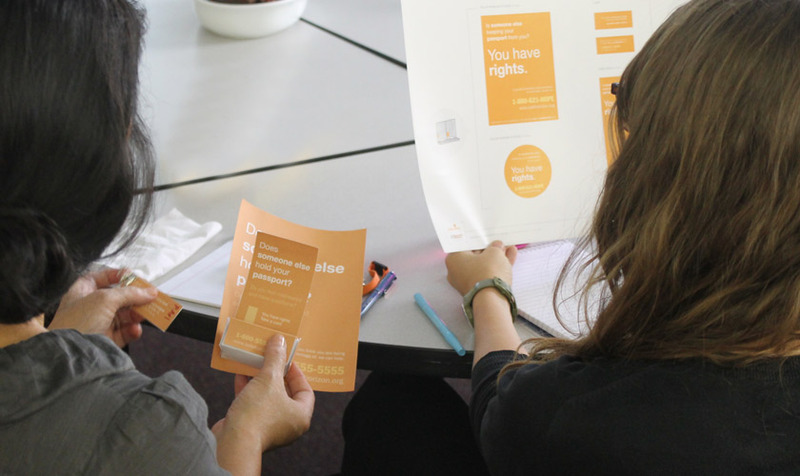 Seeking to scale their impact, Safe Horizon partnered with Reboot to develop targeted outreach materials that could help trafficked persons better understand the severity of their circumstances and the services available to support them. In New York City, victims of human trafficking are often hidden in plain sight. They are male, female, and transgender; they are of every age and ethnic origin, hailing from within New York City and from around the world. Close proximity to major international ports, a large population of immigrants, and a concentration of informal industries means severe labor rights violations can occur and go easily undetected. Tightly controlled movements and limited access to information also mean that victims are often unaware of the organizations they can turn to for help. They may not know their rights, how to seek support, or that they are even being “trafficked”. Safe Horizon’s Anti-Trafficking Program provides a variety of critical services that combat individual instances of trafficking, in addition to helping foster systemic change. The challenge has been and remains reaching victims effectively. 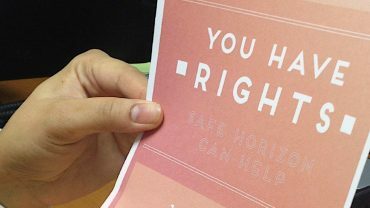 Safe Horizon partnered with Reboot to develop targeted outreach materials that could help trafficked persons better understand the severity of their circumstances and the services available to support them. Recognizing that survivors of human trafficking are the experts on their own experience was foundational to our approach. Many outreach programs reinforce stigmas and negative stereotypes associated with trafficking, such as unhelpful imagery of battered women and chains. They lack relevance and provide few facts. Our approach sought to design materials that would be informative, respectful, and, most importantly, appropriate. Through applied ethnography, collaborative synthesis, and rapid iteration, we engaged a variety of respondents in the communications design process. Respondents included human trafficking survivors from Latin America, West Africa, and Southeast Asia, in addition to experts from social services, law enforcement, healthcare, and media. The design process aimed to identify the prompts, points of engagement, and visuals that would resonate most with victims. Throughout the communications design process, we facilitated a series of workshops with Safe Horizon to document and share our activities. Each workshop presented our findings to date and design concepts for outreach materials. Workshops also provided an opportunity to discuss goals, strategies, and evaluation methods for future outreach campaigns using these materials. Our research unearthed key resonators for trafficked persons: prompts around passports and immigration status, and check cashing businesses as points of engagement. We gained understanding of images and words that positively encourage victims to seek Safe Horizon’s services. 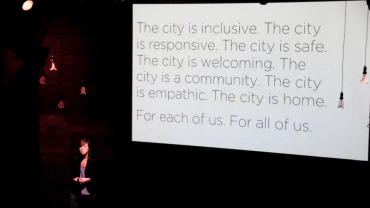 We presented lessons on reaching marginalized communities at TEDxDumbo under the theme City 2.0. Working with Safe Horizon, we designed an outreach campaign tailored to the realities of New York City trafficking victims. We also developed metrics to track the efficacy of future outreach campaigns. 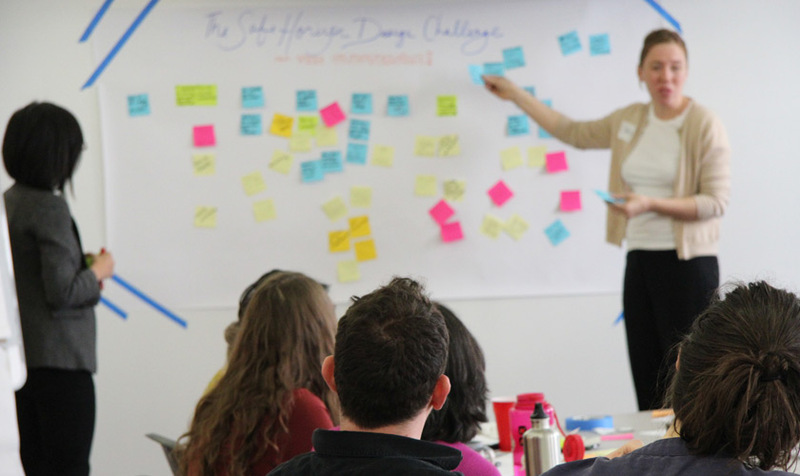 Based on our thorough documentation of the design research process, we facilitated trainings with Safe Horizon staff to enable them to employ design research tools in the future. What does resonate? Prompts around passports and immigration status. Often trafficked persons have had their passports confiscated—this is something they want back, more than “getting out of trafficking”. And the best place to engage them? Check cashing businesses. Even the most isolated individuals often have sporadic access to these shops, more so than legal clinics, places of worship, community organizations, and other places where outreach materials typically feature. Even the most tightly controlled individuals are afforded privacy for their transactions.